At first this seems unfair. 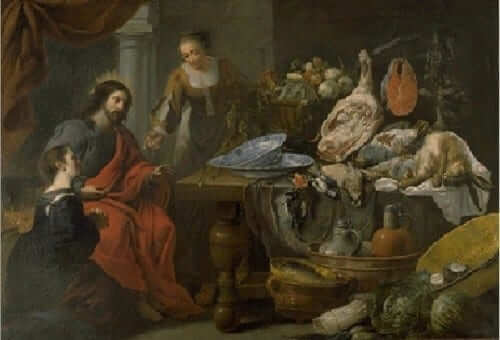 Martha is working hard at preparing the meal, while Mary is just sitting there at the feet of Jesus. So, Martha complains to Jesus. But interestingly, Jesus somewhat humbles Martha instead of Mary. Of course, He does it in a kind and gentle way. The truth is that both Martha and Mary were fulfilling their unique roles at that moment. Martha was doing Jesus a great service by serving Him through the preparation of their meal. This is what she was called to do and the service would have been an act of love. Mary, on the other hand, was fulfilling her role. She was called, at that moment, to simply sit at the feet of Jesus and be present to Him. These two women have traditionally represented two vocations in the Church, as well as two callings we are all called to have. Martha represents the active life and Mary represents the contemplative life. The active life is that life most live on a daily basis, be it through the service of family or others in the world. The contemplative life is a vocation to which some are called through the cloistered life, in that they leave the busy world and dedicate most of their day to prayer and solitude. Truthfully, you are called to both of these vocations. Even if your life is one filled with work, you are still called regularly to choose “the better part.” At times, Jesus calls you to imitate Mary in that He wants you to daily stop your work and dedicate some time to Him and Him alone. Not everyone is able to go spend time before the Blessed Sacrament each day in silent prayer, but some are. However, you should seek to find at least some time of silence and solitude every day so as to sit at the feet of Jesus in prayer. Reflect, today, upon your own call to prayer. Do you pray? Do you pray every day? If this is lacking, then reflect upon the image of Mary being there at the feet of Jesus and know that Jesus wants the same from you. Lord, help me to hear You calling me to stop what I’m doing and to simply rest in Your divine presence. May I find those moments every day in which I can be refreshed in Your presence. Jesus, I trust in You.